Some more statistics for you addicts out there. MySales summarize it neatly for us. Bronze Bar, Iron Bar, Mithril Bar and Thorium Bar are just some leftovers from leveling blacksmithing this week. I’ve been slacking @ ah more than usual, since I’ve leveled both tailoring and blacksmithing up to ~400. I did have some big sales, so I will start to implement a list sorted by the Money aswell. 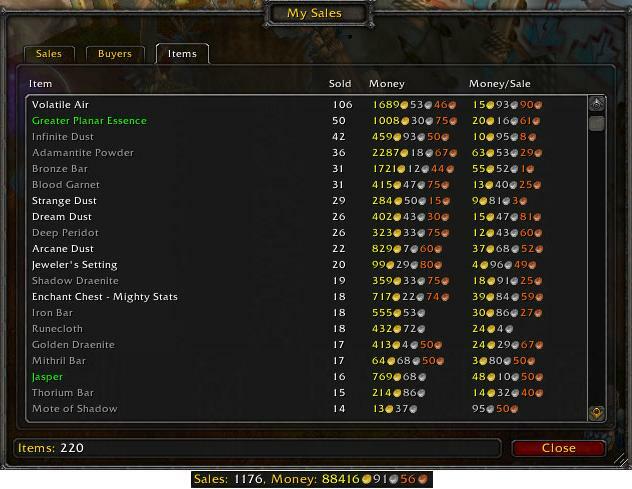 I’ve made a killing on listing Mechano-Hogs for 17-18k gold, and then spamming trade with “selling for 15k gold”. I buy the mats with my Goblin, so the vendor mats cost 10k gold instead of 12.5k gold. I’ve sold a total of 8 bikes the last 3 weeks. 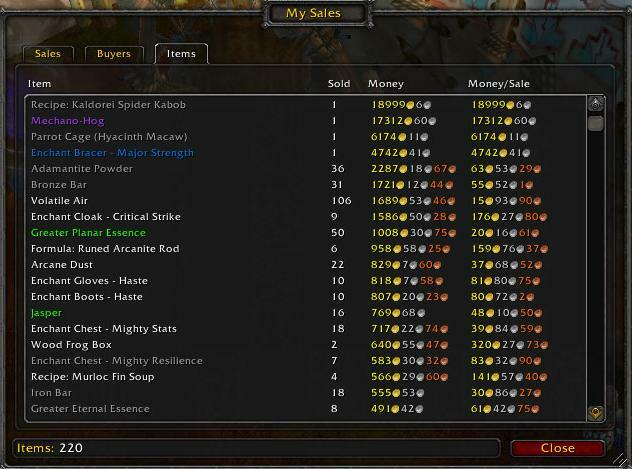 I bought Hyacinth Macaw for 3k gold in trade, and sold it the same day at AH for ~6k gold. The Wood Frog Boxes are limited supply from a Darkmoon Faire vendor, I tend to stock up with 15-20 of them while the faire is in town, and they sell now and then, for some nice chump change.